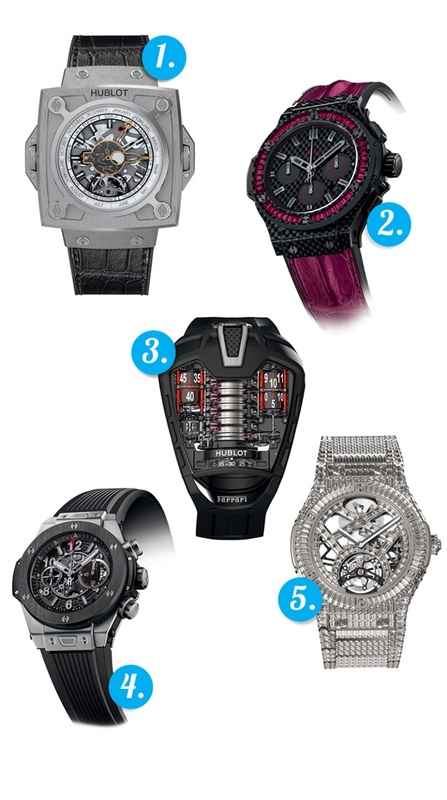 Yesterday, Hublot introduced five new timepieces. Some in silhouettes close to the aesthetics the manufacture has become known for, while further breaking the traditional Swiss-Watchmaking mold. In 1901, the Antikythera Mechanism was discovered in a ship wreck off the Greek island of Antikythera. Thought to be the first astronomical calculator, the object dates back the second century BCE. Last year, the rest of the shipwreck was united in an exhibition at the National Archaeological Museum of Athens. 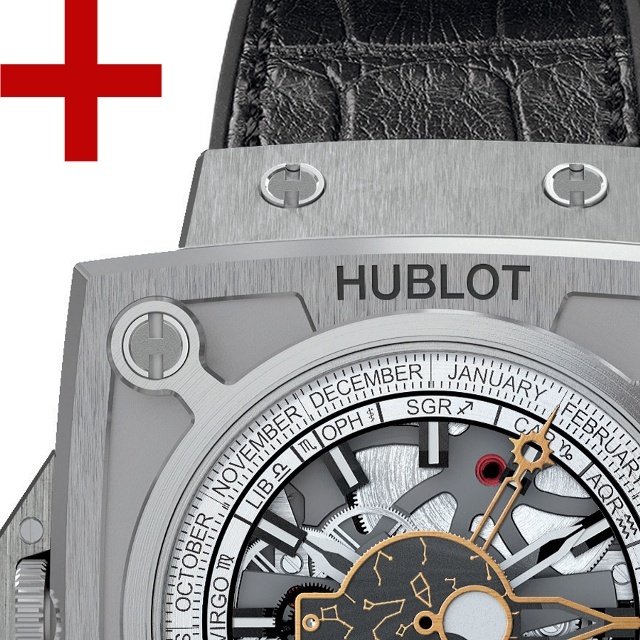 Hublot created four tributes to the mechanism, one of which currently being shown with the exhibit, another in Paris at the Musée des Arts et Métiers, the third held by Hublot and the fourth to be sold at auction in 2014. For BaselWorld 2013, Hublot created 20 pieces in tribute to their historically-inspired design. This model features a manual-winding mechanical movement with a flying tourbillon rotating once every minute to indicated seconds. In addition to hour and minute indication, the timepiece features a pivoting moon hand. The hand is read through a circular eindow with the extended end indicating in the first concentric circle the sidereal position of the moon views from the Earth. The timepiece enables the wearer to not only read the time, but to also ascertain the name of the constellation behind the sun and the time required for the sun to pass though it. Likewise, the wearer can also read the moon phase through the constellation behind it and the time required for the moon to pass through. This piece features a fusion of carbon fiber and precious stones. The process, currently under a pending patent application, was developed using traditional craft techniques by the in-house carbon fiber components production unit. The model is available in four versions, baguette diamonds, baguette rubis, baguette blue sapphires and baguette tsavorites. The timepiece is powered by the HUB4100 self-winding chronograph movement. Its case is 44mm in diameter with a carbon fiber bezel set with precious stones. Drawing direct inspiration and paying tribute to Ferrari, this model features a whopping 50-day power reserve and takes the record for most watchmaking components created to date by Hublot at 637. Limited to 50 pieces, the timepiece features a black PVD case made in titanium, Its functions including hour, minute, power reserve indicator and seconds are all indicated on anodized black aluminum cylinders. The case features a microblasted black PVD titanium caseback with sapphire crystal interior and a polished titanium caseback crown. Finishing the timepiece, a black rubber strap with a satin-finished titanium and microblasted black PVD titanium deployment buckle clasp. Hublot updated the design of their popular Big Bang design to contain the UNICO, a column wheel chronograph movement with dual horizontal coupling visible on the dial side. The movement, an automatic flyback chronograph, has a power reserve of 72 hours and an oscillating weight in back satin-finished tungsten. Its case is 45.5mm in diameter and comes in titanium or King Gold. The bezel is satin-finished black ceramic and also comes in titanium. Additionally, the dial is matte black and skeletonized. This timepiece features over one though sand baguette diamonds, or four months work for stone-setters. It took 64 experts representing 11 disciplines to complete this model. The case is Classic Fusion and 45mm in diameter made from rhodium plated white gold. The open worked dial adopted the shapes of the movement and features a stone set minute track. Framing the dial, a bezel that is also set in 120 baguette-cut diamonds. Powering the timepiece is the MHUB6010 movement, a hand-wound skeleton worked tourbillon.